Lester Alonzo Taylor was born on September 24, 1917 in Lawrence County, Tennessee. He was the son of William Wansley "Willie" and Bertha Coldonia (Comer) Taylor. Lester was a great-great grandson of John and Eliza Taylor. Lester's father, Willie, was born in Winston County, Alabama. Willie was the son of Alonzo Grant and Emma (Elliott) Taylor. Willie moved to Tennessee as a young man, met his bride and eventually made his home in Loretto. Lester's family moved to California for a short time, but returned to Tennessee. Lester was one of 10 children born to Willie and Bertha. On January 30, 1942, Lester was drafted into the United States Army. He served as a paratrooper during World War II in the 101st Airborne Division, I Company, Second Platoon, 502 Parachute Infantry Regiment. 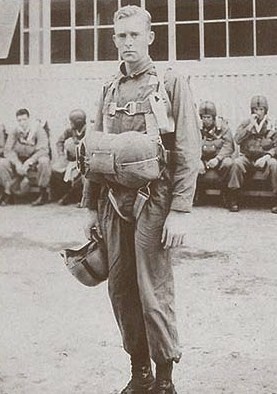 Lester's first battle jump was in the Battle of Normandy on D-Day to fight the invasion of Hitler's Nazi German troops. His unit was part of 160,000 allied troops who landed along a 50 mile stretch of beach along the French coastline. Over 110 men in his unit died in the Normandy invasion. The second jump in battle came on September 17, 1944 in Holland during "Operation Market Garden." The objective was to secure the bridges and towns along a highway that became known as “Hell’s Highway” through Holland from Eindhoven to Arnhem. "After spending the night of September 18th under heavy fire in the Zonsch Forest and still pinned in ditches along the road. Lester made the decision to cross the road intersection to help a part of his squad that was pinned down. He and two other men (names unknown to me) reportedly entered the building, gunshots were heard, and Lester exited the building being mortally wounded, however, he threw a grenade back into the building and destroyed the enemy machine gun. Two hours later, his unit and others captured more than 1100 German prisoners, the British tanks had arrived and the battle moved away from Best to other areas." On September 20th, 1944 Cpl. Lester A. Taylor was buried at the temporary cemetery, Wolfswinkel, on a farm near the town of Zon (Son). 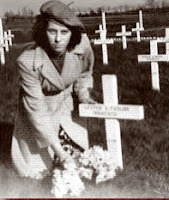 A local young woman, Dora Vogels, cared for Lester's grave in Holland. Then in 1948, Lester's remains were returned to his hometown in the United States for reburial in Restview Cemetery. The memorial service was held on Easter Sunday for Lester, a World War II hero. and grow and increase its blessings. he lives--in a way that humbles most men's undertakings.